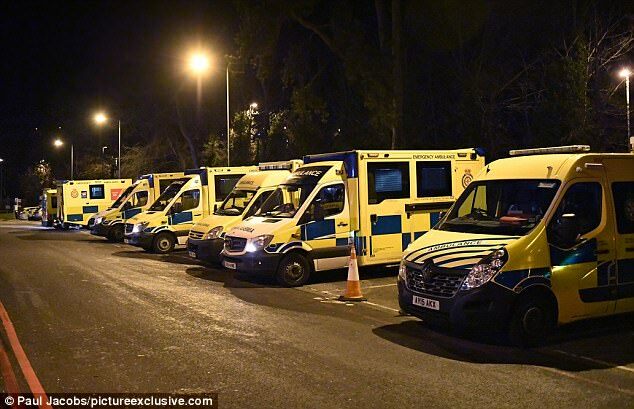 Patients waiting to be admitted were forced to wait for up to five-and-a-half hours on Friday night as 23 ambulances queued outside a hospital’s A&E department. Queen Alexandra (QA) Hospital in Portsmouth, whose A&E department has previously been described by the Quality Care Commission as ‘chaotic’, experienced an ‘exceptionally difficult weekend’ after a backlog of patients turned up with flu and other respiratory and winter illnesses. NHS figures released last week also reveal 1,336 people across the UK have been admitted to hospital with the winter vomiting bug, up from 790 the week before. Experts said this spike in norovirus cases is adding pressure to hospital beds, with 94.6 per cent being occupied, which is causing the health service to buckle under the strain, according to an ITV Meridian report. Shadow health secretary Jonathan Ashworth also blames the recent drop in temperatures for the increase in demand on hospital services.